Named in 2005 as one of Reserve America's Top Outdoor Locations. Named in 2004 as one of the Top 100 Camp-grounds in the nation. 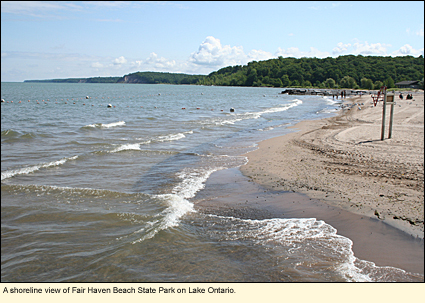 Fair Haven Beach State Park is located on the southern shore of Lake Ontario on the east side of Little Sodus Bay in the Village of Fair Haven in Cayuga County. Fair Haven is an oddly shaped park with a long entrance road boarded by scrub. Once inside the park, you will have access to Little Sodus Bay, which is west of the park and exits into Lake Ontario through a long metal breakwater/pier called Federal Pier. 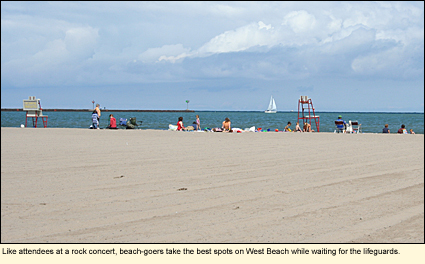 To the east of Federal Pier is West Beach, a large sandy area for supervised swimming in the lake. Part of the border of the park is created by Sterling Creek as it meanders through the park. It's part of a larger wetland complex made up of the creek, Sterling Marsh, and Sterling Pond. 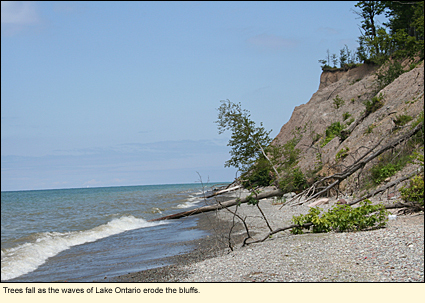 Sterling Marsh is separated from Lake Ontario by a series of low dunes. 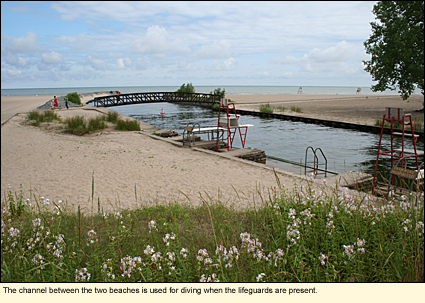 Just between the dunes and the lake shore is East Beach, another area for supervised swimming. Between East Beach and West Beach is a deep diked area for supervised diving. Going east along the shore, the low dunes rise into wooded bluffs, then go down again to sandy beach and rise again to wooded bluffs, finally ending at the small, circular Juniper Pond. Fair Haven offers more to do than any other park in the Finger Lakes Region. Fair Haven is on the Seaway Trail and caters to long-distance bikers, offering 183 tent sites. (There are no nearby laundry facilities.) In addition, the roads and paved paths in the park are ideal for children's biking. Bicycles are available for rent at the dock across from the concession building at the West Beach parking lot. Fair Haven Beach State Park has one of the finest public lake fronts in upstate New York, with high bluffs towering over 1,500 ft./457 m. of sandy beach. 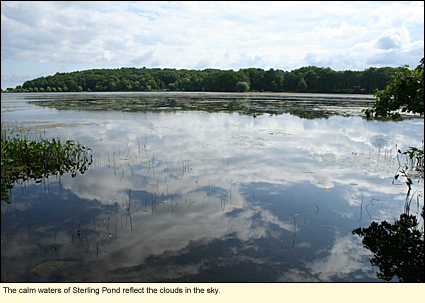 Sterling Pond, Sterling Creek, and Little Sodus Bay are interesting places for novice and intermediate kayakers and canoers to explore. Kayakers who wish to explore Lake Ontario should be proficient in sea kayaking. 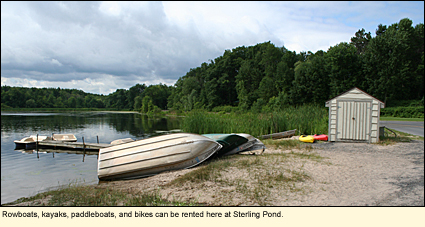 Rowboats are generally appropriate only for Sterling Pond and certain parts of the bay. The entire bay is appropriate for motorboats and sailboats of any size, which provides direct access to the lake. There are a number of marinas in Fair Haven and public access to the bay is available from launch sites in Fair Haven other than in the park. Canoes, kayaks, and paddleboats are available for rent at the dock across from the concession building at the West Beach parking lot. 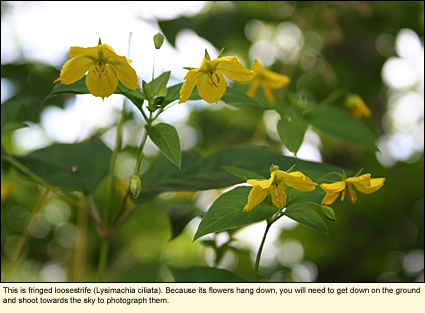 It should not be overlooked that Fair Haven has some very interesting plants that, although not rare, are unique to beach, pond, and woodland habitats. Many are quite lovely and present excellent photo opportunities. Half a mile east of the entrance to the park is Springbrook Greens State Golf Course, an 18-hole course that is part of the park. The park has several miles of easy (1-2 boots) trails through varying habitats. There are several short trails that begin from the end of the Lakeview Camping area and wind through the woods. These provide a variety of wildlife viewing opportunities, especially if you walk quietly. Some of the trees in this area are quite old and large. There is also a spot where you can access a service road that takes you to and along the lake shore to the bluffs and then back via a wooded trail. All of these trails are interesting and worth the walk, however, you will need a copy of the park brochure to see where they are located as the trail heads and intersections are not well marked within the park. Plans are in the works to connect the trails of Sterling Park and Nature Center with the trails in the park. 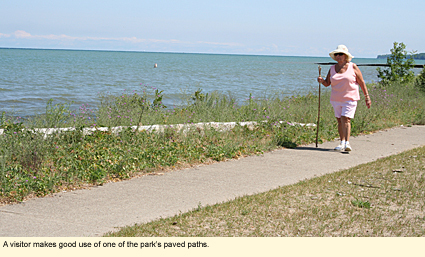 There are a number of paved paths in the park as well as the paved Federal Pier. When the park is not busy, jogging and walking along the roads is relatively safe. The main roads and the paved paths probably make up at least 2 mi./3.2 km. Pets must be leashed everywhere in the park. Picnic areas are scattered throughout the park. Some picnic tables have lovely views or are situated near water. There is one open picnic pavilion, an enclosed picnic pavilion, and Sabin Hall, all of which can be used for group events. Fair Haven is a carry-in/carry-out park. The park has three playgrounds--a small playground in the Drumlin Camping Area, another with ball fields near the Lakeview Camping Area, and third just off West Beach. The park offers several supervised swimming sites. Both East Beach and West Beach have their own bathhouses. In between the two beaches is a deep channel with diving boards. 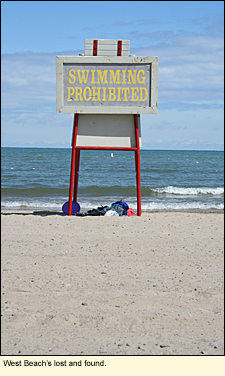 Swimming is not permitted when the lifeguards are not on duty. There is a volleyball net installed on West Beach. The park gladly accommodates group events such as weddings and reunions. Receptions can be held in rented tents or in Sabin Hall, which has an indoor fireplace. There is a wide variety of wildlife in the park, including deer and small mammals like raccoons, chipmunks, squirrels, and opossums. Otters are known to frequent Sterling Creek. There are numerous species of reptiles and amphibians, as well as a good selection of butterflies and odonates. Birding is exceptionally fine in the park most of the year. During migration, birders should be able to find many passerines and raptors in the woods on the bluffs and in the scrub along the entrance driveway. During the summer, the woods on the bluffs has just about every woodpecker, thrush, and vireo species known in the Finger Lakes, most of the woodland warblers, and birds like blue jays, pee wees, goldfinches, northern orioles, turkeys, and many species of hawks and owls. Canada geese, mallards, and mute swans breed on Sterling Pond and kayakers may find herons, red-winged blackbirds and other marsh birds in the cattails of the marsh. 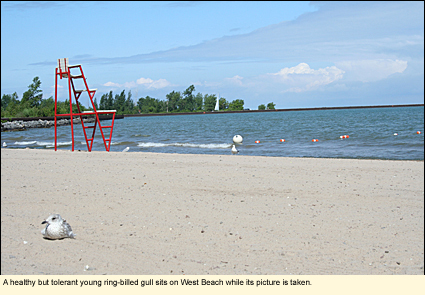 Herring gulls, ring-billed gulls, and common terms frequent the lake shore. Cross-country skiing, snowshoeing, and snowmobiling are permitted in the park. ATVs are not permitted in the park at any time.